I've been struggling with some of the writing for this one - mostly having to parse down some of the background commentary and make things sync with what i was trying to do with this next comic. I'm getting there, hopefully will have it up soon, but till then you can look at the artwork for the comic, which stands well on it's own and is even a tad humorous in places. 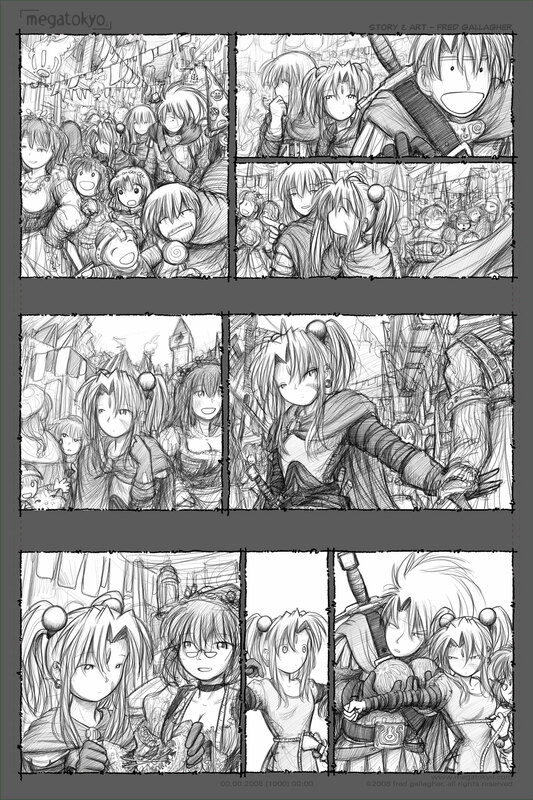 It's about half the resolution of the size i work at, but that's bigger than the standard webcomic size, so you might find it interesting to look at while you wait. Thanks for your patience. There is a major confluance of ideas and themes going on in this hinge point of the chapter, and as usual it's giving me headaches. Thanks for reading, the finished comic to come later. I went into Up knowing that I would cry. When I first heard about the premise at Wondercon in February, I thought "Wow, that's much more mature than I expected - I didn't think a Pixar movie would deal with death." Then Pete Docter and the other presenters showed a few of the comic scenes after introducing Carl and Russell, and my initial thoughts were washed away in a flood of talking dogs and big colorful snipes. Two weeks ago, I'd already bought my ticket to Up when my mother died. After the funeral, I thought about the movie again, and remembered the first part of the Pixar presentation, the one about Carl Fredricksen as a widower with an unfulfilled dream. I thought back to the emotional depths Finding Nemo explored, and I realized that I was going to see my own parents in the movie. Pixar's best work tells a story you can easily see yourself in, once you strip away the talking fish, animated toys, or other conceits that mask the universal nature of the narrative (this is why A Bug's Life keeps dimming in my mind as Pixar really comes into their own as a studio of storytellers). In those few minutes at the beginning of Up, I didn't watch Carl and Ellie Fredricksen - I watched a masterpiece of storytelling that depicted a loving couple's journey through life together, and when Ellie's story came to its inescapable conclusion, I found myself letting out all the emotions I'd locked away at my Mom's funeral. It was like I'd watched Mom grow old and die a second time, and it felt more real and immediate to me than her actual death at home earlier in the month. I felt those same emotions well up inside me again just before the climax of the movie (I'm trying not to spoil TOO much for people who haven't seen the movie yet - what I've said so far has been public knowledge for some time), and even though the action and comedy were absolutely top-notch efforts from a creative team that is clearly one of the best in the world, I walked out of the theater in a thoughtful mood. I thought about my Dad, one of thousands of Carls in the world, looking for direction in a life that suddenly feels rudderless, and about a house that can be bright and cheerful, yet cavernously empty at the same time. I thought about myself, I thought about my sister, and I thought about how this movie would be so cathartic for all of us, and help us in our own way. I told my sister as much - later that weekend, my sister text messaged me on her way out of the theater. She simply said, "You were right. I cried twice." Thanks for the adventure, Pixar. It's played a big role in helping me move toward my next one. It's been a rough year, folks, but there are 7 months ahead that can turn this puppy around. Watching up 2-3 more times will be a good start.